Welcome to the world’s easiest and most delicious sandwich ever– Vegan Pesto Grilled Cheese! I used marinated, semi-dried tomatoes from Trader Joe’s in these vegan pesto grilled cheese sandwiches, but you can always use sun dried tomatoes packed in olive oil if that’s easier to find. While store bought vegan pesto is a fantastic convenient option, if you really want to up your sandwich game, I highly recommend making a batch of my World’s Best Vegan Pesto. It takes just five minutes, uses hemp seeds instead of pine nuts as a wallet-friendly swap, and tastes out of this world. I served this Vegan Pesto Grilled Cheese at Burning Man this year, where over 250 people lined up for these sandwiches! It was a crowd of mostly non-vegans and everyone loved it. There is so much flavor packed in, you won’t miss the dairy, I promise! If you try these Vegan Pesto Grilled Cheese Sandwiches, be sure to rate them in the comments! While you’re at it, tag a photo on Instagram with #carrotsandflowers so I can admire your creations! There’s nothing that makes me happier than seeing people enjoy my recipes. I LIVE for it! Mega-easy vegan pesto grilled cheese. 5 ingredients + BIG FLAVOR. Marinated tomatoes and balsamic glaze elevate this simple sandwich into a gourmet treat. Spread 2 tbsp vegan pesto on 4 slices of bread. Divide the tomatoes and cheese among the four slices. Put a griddle pan over medium heat. Drizzle each slice with ½ tsp balsamic glaze, then top with the remaining bread. Spread the outsides of the sandwiches with 1 tbsp vegan butter each. Cook the vegan pesto grilled cheese sandwiches on the griddle pan until golden brown on the outside and melty on the inside, about 2-3 minutes on each side. 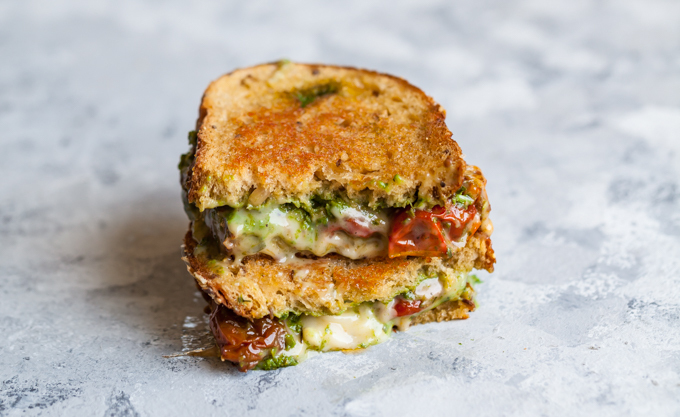 If you love this Vegan Pesto Grilled Cheese recipe, be sure to check out our 20 Minute Vegan Quesadillas with Homemade Cashew Mozzarella or our Vegan Pesto Pasta with Tofu and Peas! How does melted (vegan) cheese look so mouth-watering! !